We’re returning to ECAC this week to explore lineups for the Division II wing of the conference, which competes in a separate conference championship but gets results at a similar level to its Division I counterpart. Half of the Division II teams in the country compete in the ECAC, so this conference is always compelling to watch. 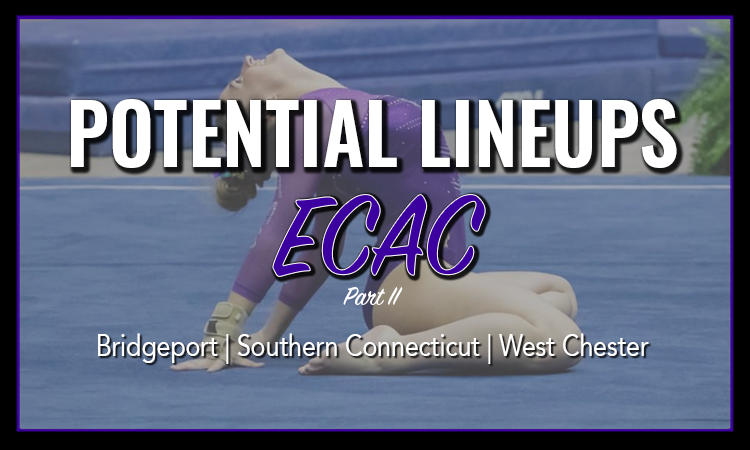 Bridgeport dominates ECAC-II: It’s the 10-time defending conference champion and a perennial contender at USAG nationals. The Purple Knights lose only five routines from the 2018 postseason, and with six talented newcomers, they should have plenty of lineup options in 2019. The Purple Knights return more than a full lineup of regular vaulters from 2018 despite losing their top scorer in Kelsey Campbell, so they’ll have the luxury of using freshmen to replace less difficult vaults, like Yurchenko layouts, rather than needing to fill gaping holes. Varvara Diakakis and Julianna Roland bring strong Yurchenko fulls that are likely to see regular lineup time. Crystal Gwinn and Jordan Streete also compete fulls, though Gwinn’s is less consistent and Streete scratched vault in several recent meets, potentially indicating an injury. The freshman vaulters will join a lineup lead by upperclassmen Maya Reimers, Nina Whittaker and Brieanna Zine, as well as sophomore Gabrielle Kistner. Kathryn Doran isn’t strongest on vault, but she might also see time here to complete her all around set. Bars is the event on which Bridgeport loses the most from 2018—and while that’s still only two routines, those two were the team’s strongest contributors. This event might become a weakness in 2019, with most freshmen never breaking the 9.000 mark in level 10. Roland leads the freshmen in scores, and Hayley Bangart could be a standout here with a difficult routine that includes a Ray. Diakakis is also an option, especially if she improves the execution of her knees and feet. However, the list of options is short, so the Purple Knights will hope for Lauren Ramirez—a former all around J.O. star and Nastia Liukin Cup champion who was injured late in high school and restricted to beam in 2018—to be healthy enough to make a return here, as well as Maya Reimers, who competed all around in freshman year and then dropped bars in 2018. Sophomore Gabrielle Kistner is another potential as she competed all three other events her freshman season. Either way, the star power of former USAG runner-up Thomara Powell-Brown and sophomore standout Kathryn Doran should save this lineup from disaster. Beam is a perennial strength for the Purple Knights, and with two sophomores—Doran and Ramirez—leading its returners, that shouldn’t change any time soon. The most likely freshman contributors are once again Diakakis and Roland, who have the highest J.O. scores of the cohort, as well as the distinctive poise of Bridgeport beamers. Crystal Gwinn has a less consistent scoring record, but her skill set and dynamic style could land her in the top six too. Bridgeport is known for its polished performances on floor, and with three returners with RQSs over 9.800, as well as a strong incoming group, expect it to be a strength in 2018 as well. Gwinn could be a star here, with powerful tumbling and an exuberant presence. Roland and Streete are strong mid-lineup choices, with great performance ability and strong tumbling sets led by matching double pikes, and Diakakis could also figure in, though she has been less consistent in J.O. As well as the top three returners, Doran could also return to this lineup to complete her all around set. Bridgeport’s strong freshman class should lead it to a stronger season on three events than in the past, and there are enough bars options to find a consistent lineup there too, though it might take a few weeks of trial and error to figure out the ideal six. The all around might be equally contentious, with up to five options—Doran, Reimers, Roland, and possibly Diakakis and Kistner—each with advantages and liabilities across four events. In recent years the Knights have been consistent in the regular season but struggled to keep pace with their surging USAG rivals in March and April. But with this year’s influx of depth—and not to mention nationals on their home turf—they will hope to change that trajectory. West Chester’s ranking has held steady in recent years in the 60 to 65 range, and after narrowly missing out on qualifying a team to USAG nationals last year, it’ll hope to step up in 2019. Luckily, it loses only six postseason routines and should have plenty of new options from its freshman class of eight. After losing two of its top vaulters in Chan and Blair, West Chester will be looking for freshman who can contribute here, especially ones who compete more difficulty than the Yurchenko layouts that usually fill the first half of its lineup. Sara Bell’s Yurchenko half will likely see time, even if it is slightly tucked, and Ashley Duke competes a beautiful tuck full and has trained a layout full. Brashlyn Johnson’s layout full is strong and will likely be featured at the end of the lineup. This group of freshmen also brings some strong layouts, including those from Annie Bailey and Julia Marinari, which are useful as backup options. This cohort is sure to help increase the level of difficulty of this lineup. The Golden Rams’ freshman class almost all bring usable bar routines, but they’re a difficult group to predict: The few with higher peak scores have been very inconsistent in J.O. 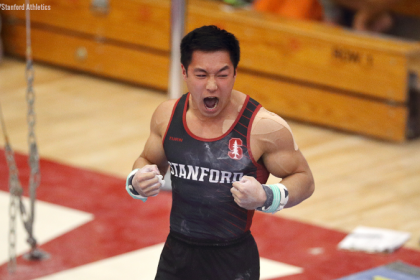 Many of these gymnasts sat around the 8.800, but video shows promising skills that a smart college coach could make into a viable routine by reducing built-in deductions. Brashlyn Johnson has a strong Deltchev, while Annie Bailey and Ashley Duke have strong Giengers. This lineup could be helped immensely by the return of sophomore Yolanda Nodarse, who was restricted to beam in 2018. West Chester returns most of its 2018 beam lineup, though not all contributors are consistent on this piece. Luckily, the freshmen bring a wealth of new options. Johnson had the highest J.O. scores of the cohort along with McKenna Kissinger, and both have the skillset to be valuable contributors in college. Other options include Duke, who is elegant and airy on this piece, as well as the steady and composed Rose Fanara. Due to the nature of the apparatus, it’s likely lineups will depend more on preseason performance than any previous accomplishments, but with several returning stars the Rams have the depth to improve significantly on beam in 2019. Floor shouldn’t be a problem for West Chester in 2018, with only one routine lost from its regular lineup and plenty of incoming options. 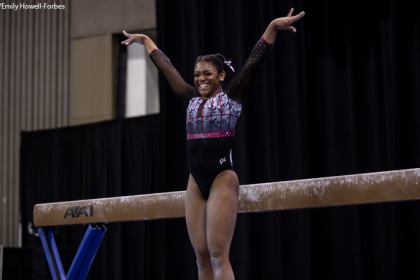 This is Fanara’s key event, bringing scores of up to 9.550 in level 10 with impressive consistency, and Johnson matched her accomplishments with a strong tumbling set. Kissinger and Bailey are both compelling performers with lineup-level tumbling, and if Nodarse is at full form this year, she could excel here too. Expect this lineup to become a serious strength for the Rams in 2019. West Chester could be set to make major improvements on three events in 2019, and will just be hoping for bars to keep pace with its other events. (You’ll notice this is the same story we found with Bridgeport as bars is a common sticking point for teams in the bottom half of national rankings.) That said, the depth increase that the Rams’ newcomers bring is massive. They didn’t have a regular all arounder last year, but freshman Brashlyn Johnson could see time in all four events this year, as could one-time all arounder Jordan Miranda. Southern Connecticut’s three event star, Kathleen Aberger, graduated in 2018, so it will be critical for the Owls to replace the regular 9.700-plus routines she contributed last year. Luckily, on top of a very useful freshman class of seven, the Owls return numerous backup options on each event, so at the very least depth shouldn’t be an issue. Like most teams ranked in this region, SCSU’s vault lineup is composed primarily of Yurchenko layouts and front handspring fronts, and the freshman class brings some more options in those styles plus a few with more difficulty. Hannah Stahlbrodt competed a half-tucked Yurchenko full in level 10, and even if she needs to compete it fully tucked to land it properly, it will be an asset. Cassidy Girolamo trained a tuck full this summer, though her most recent competition vault is a Yurchenko layout. Of the simpler vaults, expect transfer Jordan Peloquin to see time with her ultra-consistent front handspring front, and Chelsea Baker has gotten good scores with what we presume to be a Tsuk layout. Once again, bars could be a trouble spot for the Owls, but they are adding a few very useful routines that will lessen the blow of losing Aberger and Kasey Kilmurray. Chelsea Baker is a potential star, with J.O. scores up to 9.550 and beautiful technique. Natalie McCormack also has a great skill set, including a bail to actual handstand—a rarity outside the top tier of teams—and Connecticut native Isabella Lanata has an efficient routine that could be an asset with a bit of work on consistency. The Owls produced beautiful beam work in recent years, and 2019 should be no different: Their freshman class has more star power on this event than any other by far. Baker will win fans with a press handstand to split mount. Plus, she hasn’t missed a beam routine in two years, so she’s a frontrunner for the top six. Girolamo brings poise and a high scoring ceiling, and Stahlbrodt surpasses them all with a top level 10 score of 9.625 achieved because of fantastic technique. Sophomore transfer Peloquin is also an option here—she’ll need an update to the front to back acro series she used in her J.O. days, but that shouldn’t be a big problem since her routine already features a separate kickover front. Floor is the event on which the Owls were hit hardest by graduating seniors, losing its three best routines by high score, but luckily they are bringing in plenty of options. This is the event where transfer Peloquin might contribute most: She’s a twisting dynamo who scored as high as 9.550. Stahlbrodt could also be successful with the help of her beautiful dance skills, and Noely Macias will bring stunning dance and an extremely consistent front double twist, an E-level pass in NCAA. The rest of the newcomers score only slightly below this top group, including all around possibility Baker. Southern Connecticut brings in some fantastically stylish athletes, as well as big difficulty that could make a big difference in its lineups. 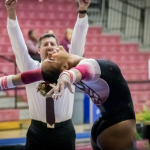 Expect beam and floor to develop as strengths, despite the significant losses from last season, and for the Owls to inch closer to their Division II rivals.